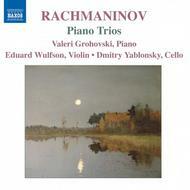 This disc brings together three superb Russian soloists to play the exquisite Rachmaninov Piano Trios. The cellist is Dmitry Yablonsky, previously praised as �a high class player� on previous recordings of piano trios by Gramophone. Although written before Rachmaninov reached the age of 21, the two mournfully expressive Piano Trios are wholly characteristic works. With their challenging piano parts and radiant melodies they clearly show the direction Rachmaninov would take as a mature composer. Cast in a single, sonata-form movement, the first Trio �l�giaque seems not to have been inspired by any particular melancholy event. Headed �A la m�moire d�un grand artiste� (In Memory of a Great Artist), the second Trio was written in response to news of the death of Tchaikovsky in 1893.